Author: Karmen, Steve Set In . . . Description: Me and Bobby D. is the exciting coming-of-age story of two teenage boys from the Bronx - Steve Karmen and Walden Robert Cassotto - who meet in high school, play in the same band, and then form a singing act. The year is 1956, at the dawn of rock and roll, a crossroad in the entertainment business rarely written about. Cassotto changes his name to Bobby Darin, makes his first recording, and he and Karmen are booked on the road for their first job ever as entertainers into Club Temptation, a seedy nightclub in suburban Detroit. 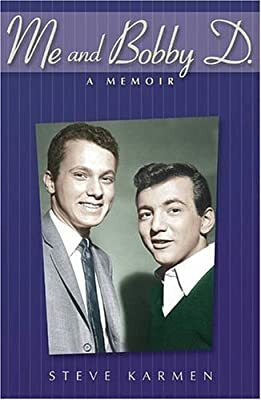 This is Bobby Darin before "Splish Splash," "Mack, The Knife," "Beyond the Sea" and "Dream Lover"; and Steve Karmen before composing "I Love New York," "This Bud's for You," "Hershey Is the Great American Chocolate Bar" and "Nationwide Is on Your Side." What happens to them during the two-week engagement will alter their friendship, and change both of their lives forever. B/W photos; Hardcover; May; Biography; World Rights Steve Karmen has been a composer/lyricist/arranger/producer of advertising music for over 30 years. In addition to the above-mentioned themes, some of his most memorable compositions are: "Here Comes the King (The Budweiser Clydesdale Theme)," "Hertz, We're America's Wheels," "Weekends Were Made for Michelob," "Sooner or Later, You'll Own Generals," "Quality Is Job One - Ford," "We Build Excitement - Pontiac" and "At the Nevele." He is the recipient of 16 CLIO Awards, the "Oscar" of the advertising industry; the author of Through the Jingle Jungle, the accepted textbook about the industry, published by Billboard Books; and The Jingle Man, a collection of 152 of his jingles, published by Hal Leonard Corporation. Karmen lives in Westchester, NY.